1. Use safe water and food. Certain foods are more frequently associated with foodborne illness. Get informed by knowing the source of your food. Doing so can help you make more informed decisions. 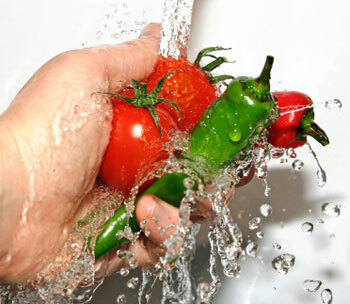 Cleaning food properly can be one of the most important ways to prevent foodborne pathogens. Though it might seem obvious, thorough hand washing before food handling is a must--and cooking and cutting surfaces should always be kept sanitary. Separation helps prevent cross-contamination. Be careful to separate raw food (particularly meat, poultry, seafood and eggs) from other items when shopping and cooking. Use different cutting boards and utensils for raw and non-raw food. Cooking food to prevent pathogens boils down to two Ts: temperature and time. Don't rely on your eye--a thermometer is the only proven performer in determining when food has been cooked to the proper temperature. Avoid raw or undercooked egg products--raw cookie dough is included! It's all about the chill when it comes to slowing down the growth of bacteria (they traditionally love warm temperatures and can grow rapidly at room temperature). Refrigerate raw and perishable foods within two hours or within one hour in very hot weather. While foodborne illness affects millions of Americans each year, the vast majority of these cases are never reported to public health officials. The act of reporting foodborne illness will protect your friends, neighbors and the general public. Seek medical attention if you are sickened.